The Brook Hill School strives to ensure that students have access to technology resources that they need to support their success. As a part of our Technology Mission, Brook Hill provides all students in grades 6-12 and their families free access to Microsoft Office 365 for Education. This powerful Microsoft platform provides the opportunity for our staff and students to create, share and collaborate with each other. Access to the online versions of Word, PowerPoint, Excel and OneNote via a web browser. 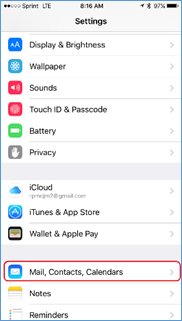 The online versions are similar to the Windows/Mac versions, but with some limitations. 1TB of cloud storage via Microsoft OneDrive for each student. 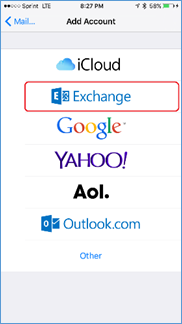 Student OneDrive accounts are accessible on campus or off so files are always available. 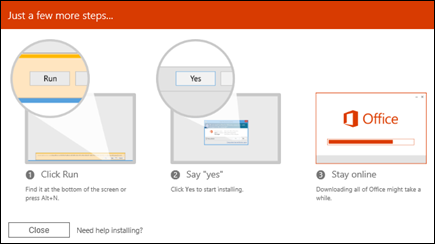 Ability to download & install the full version of Microsoft Office on up to 5 personal devices (PC, Mac, and mobile devices) per student account–free of charge. 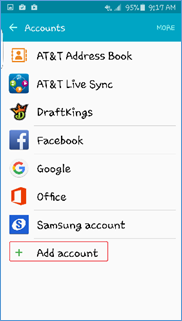 Office mobile apps can be downloaded from the appropriate device’s app store. Full editing capabilities are available on mobile apps once students login with their Brook Hill username/password. Brook Hill email accounts for students grades 7-12. 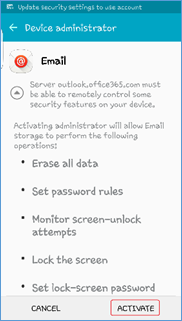 How do I access Office 365 and my student email? 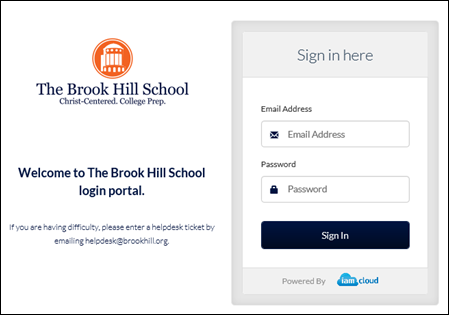 Students access Office 365 by logging into the Brook Hill Portal using their Brook Hill username/email address and password. The Brook Hill Portal can be found at office.brookhill.org. There is also a link under “Quick Links” on this website. Please note: Student email accounts are based on their Brook Hill computer/wifi username. 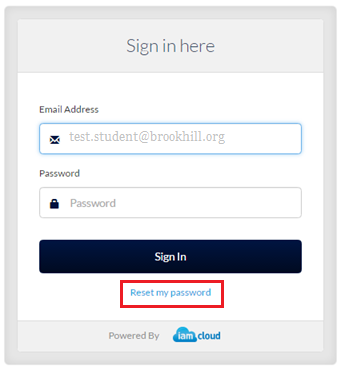 Simply add “@brookhill.org” to the student username to make the email address. For example, a student’s username is “test.student”. The student’s email address would be “test.student@brookhill.org”. 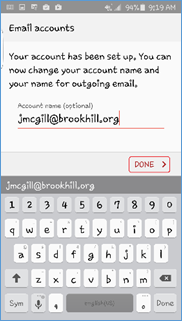 Can I add Brook Hill email to my iPhone/iPad? Yes! 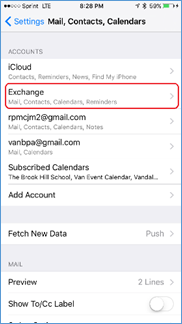 Setting up your iPhone/iPad to receive Brook Hill email only takes a few minutes. 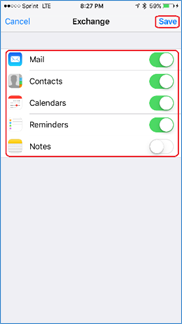 YOU MUST USE YOUR CELLULAR DATA WHEN YOU SET UP YOUR EMAIL!! Tap Next. Your credentials will be verified. 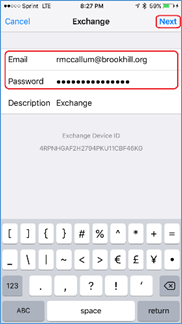 Determine which items you want to receive on your device. Tap Save. 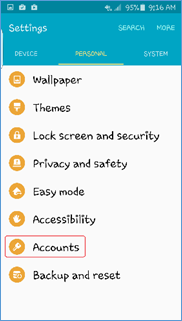 Your account will be added. 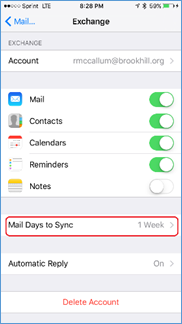 By default, iPhone/iPads will store only the most current 1 week worth of email. 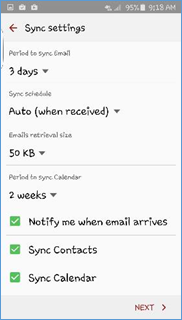 If you would like older emails on your device, you need to change this setting. 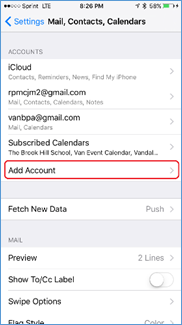 To switch between email accounts (if you have more than Brook Hill email on your device), tap the email account you wish to view. 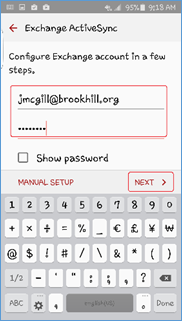 Can I add Brook Hill email to my Android device? Yes! 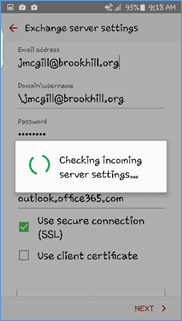 Setting up your Android phone or tablet to receive Brook Hill email only takes a few minutes. 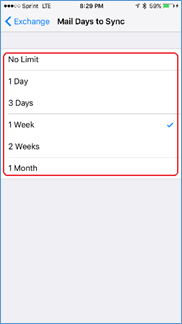 YOU MUST USE YOUR CELLULAR DATA WHEN SETTING UP YOUR EMAIL! Click OK when asked to continue. If you have more than one account you may need to switch over to see your Brook Hill email. Students can select this link, answer their security questions and reset their password. I'm a new student. How do I get my Brook Hill username & password? New students must visit the Tech Office (located in Lauderdale Hall next to the Commons) to setup their Brook Hill username & password. Once this has been setup, students can access the Brook Hill Portal and Office 365. What happens when a student leaves Brook Hill? If a student withdraws from Brook Hill his/her subscription for Office 365 for Education will expire immediately. Brook Hill graduates will have access to their Office 365 accounts (including Brook Hill email) for 6 months after graduation. Online services will no longer work. This includes your Book Hill email address, Office Online and OneDrive document storage. 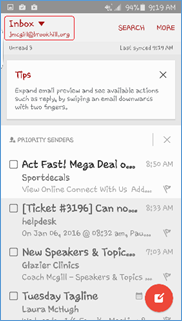 Where can I find training on Office 365 ProPlus? 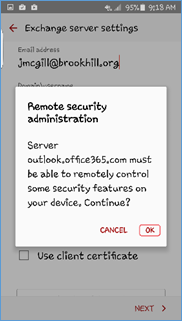 Can Office be installed on more than one device? Yes! Microsoft Office can be downloaded to 5 PCs, plus you can download the apps for iOS and Android devices. 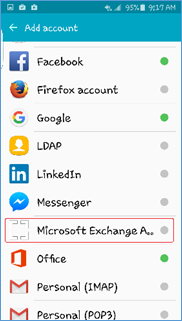 How do I download & install Office? Login to the Brook Hill Portal (office.brookhill.org) using your Brook Hill email address & password. Depending on your browser, you may be prompted to run, save or download. Follow the instructions and your install will begin.